ALBANY, California, May 14 2012 (IPS) - With hoes, shovels, some 15,000 seedlings and a bolt cutter to break the locks that kept them out, students, community members and participants from nearby Occupy movements have laid claim to an undeveloped 10-acre parcel since Earth Day, Apr. 22, in Albany, California. But Monday, some 100 university, city and county police took back the land and arrested seven occupiers (see sidebar). The parcel, owned by the University of California, Berkeley and known as the Gill Tract, is located about two miles from the campus. The university plans to sell a portion of the tract to developers for an upscale supermarket and market rate senior housing. Researchers use around two acres annually, for a few months, for crop studies. The occupation date coincides not only with Earth Day, but with Via Campesina‘s International Day of Peasant Resistance on Apr. 17, when peasants, small farmers, landless people, migrants and agricultural workers around the world attempt to reclaim land. At about 6:30 a.m. Monday, May 14, around 100 university, city and county police in riot gear raided the Gill Tract farm. They gave a group of about half a dozen people inside – whom Occupy the Farm spokesperson Leslie Haddock said were engaged in farming activities – the choice to leave or be arrested. Two were arrested inside the farm and five others were arrested outside the gates, for failure to disperse. By around 7 a.m., a crowd of around 50 farm supporters had gathered on the sidewalk chanting, "Whose farm? Our farm!" and "The farm belongs to the people." Spokesperson Haddock said she'd slept at home last night, believing "we had engaged in good faith with the university" having moved the encampment off the land as the university had asked, and having made it clear that they could co-exist with research being done there. "I am shocked that the police are here this morning," she said. University Spokesperson Dan Mogulof, however, told IPS that the university had made it clear that the research could not go on while occupiers were on the site. "If the research activities didn't start this week, our faculty and students would have lost an entire year of work," he said. He added that the College of Natural Resources had been engaged with the community and nonprofits about using part of the land for urban farming and that those discussions would continue. Occupy the Farm advocates are meeting Tuesday to talk about the future of the Gill Tract. “(L)and occupation is an internationally legitimate and historically proven strategy for land reclamation,” writes UC Berkeley graduate student Rebecca Tarlau on the group’s website. Calling themselves Occupy the Farm, the activists address socioeconomic inequity and corporate greed. They cite injustice in the distribution of nutritious food in the United States, with 50 million people lacking regular access to healthy food. And they condemn what they say is the growing influence of corporations on the University of California. The university reacted to the occupation by turning off the water just a few days after occupiers began farming, forcing them to truck water onto the site. After telling activists to leave for two weeks and being ignored, the university stationed police and private security inside the tract, first locking three gates, then locking all four, forcing occupiers to enter and exit over the fence and walk across fields to water their crops with buckets of water, filled from a truck parked outside a locked gate. On May 9, the university sued the occupiers for trespassing and preventing researchers from doing their jobs. While the university says the researchers cannot conduct their studies with occupiers on the land, occupiers, and at least two of the five researchers, say they can coexist. Miguel Altieri is a professor in the College of Natural Resources and has conducted research at the tract for 31 years. He’s outspoken in his support for the occupiers. He said, along with community members and nonprofits, he has been calling for opening up the tract for 15 years, but has been ignored by the university. Altieri would like to see a centre on the land where people learn urban farming, then teach the skills to others in the community. “We need to start raising food in our cities,” Altieri said, noting that there are some 500,000 people in the Bay Area with inadequate diets. “There’s 120 acres of abandoned land (in Oakland) that could be used to produce food, if the people had the skills,” he told IPS. The university administration said it would dialogue with the occupiers, but only after they left the property. In response, on May 12, the occupiers removed tents and camping gear from the land, but left their farming tools. “We decided that we would in fact remove all of our things that support living (and place them) outside, just to be clear that we’re not here to live,” said Anya Kamenskaya, an Occupy the Farm spokesperson. “We’re leaving all the farming infrastructure inside the farm. Just as the larger Occupy Movement shines a light on corporate greed, the occupiers are using the farm occupation to confront what they say is increasing corporate influence on the university. “The global food regime is controlled by a handful of monopolies,” said Eric Holt-Gimenez, speaking at a May 12 workshop at the tract. Holt-Gimenez is executive director of Food First, a non-profit Oakland-based organisation that addresses issues of poverty and global hunger. Holt-Gimenez was referring to the half-billion dollars for biofuels research that BP is giving the university. University spokesperson Dan Mogulof countered that only a “tiny fraction” of research money comes from the private sector and that, when it does, corporations don’t tell academics how to conduct their research. He further pointed out that nonprofits also fund research, such as studies on issues in human rights. 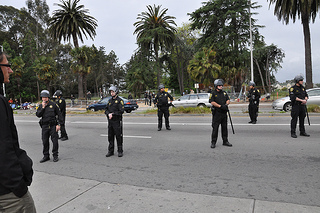 Until Monday, University of California police had been relatively low-profile since protesters arrived at the Gill Tract. Some have suggested that is because the university and its police departments in Berkeley and Davis have been heavily criticised for police beatings and pepper spray use against Occupy activists in November. A May 4 report, authored by the dean of the UC Berkeley Law School and the university’s general counsel, said the university needs to change the way it handles protests: “The Chancellor and other administrators should develop and follow a set of guidelines designed to minimize a police response to protests, and to limit the use of force against protesters wherever possible,” the report says. While police and private security were stationed at the gates and around the perimetre of the tract, they maintained a generally friendly demeanor, unlocking the gates for those who want to leave and ignoring those who scale the fence – or climb up the newly-built stairs and use the slide to slip inside. At this point, the future of the tract is uncertain. In a May 11 letter, the chancellor’s office recognised value in the occupation: “As much as we abhor the tactics embraced by the occupiers, we acknowledge that their actions helped to raise the public profile of urban agriculture and generate constructive conversation about its value,” it said. In that letter, the university invited occupiers to a meeting with about a dozen participants the university selected to discuss the tract’s future, with occupiers’ participation conditioned on completely vacating the property. 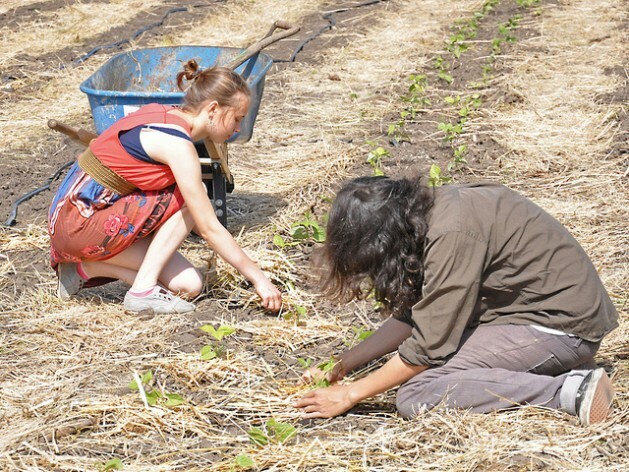 The occupiers responded by packing up their tents, but refusing to abandon their crops and refusing to participate in a planning process that wasn’t open to all. Gopal Dayaneni, an Occupy the Farm spokesperson, said on Sunday that he hopes the university will join activists in an open planning process “that isn’t based on sabre-rattling and threats”. In the meantime, “We’ll be watering our fields and tending our crops,” Dayaneni said.